'Tis the season for cookouts, barbecues, and other generally non vegetarian friendly events. I went to a cookout over the weekend where there was literally meat in everything. (can someone explain to me why pasta salad MUST contain meat? what's wrong with some noodle action and fresh veggies?) The next day I went to a cookout where there were a few more options for me (fruit salad, watermelon) and the host was very concerned about having food for me and even offered to grill me up some fake meat on his brand new grill, but I didn't have the heart to tell him that I didn't really want burger juice all over my food. But kudos to him for at least considering that I might want to eat something. 2. 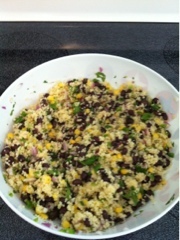 Fold beans, corn, onion, cilantro and jalapeño, if desired, into couscous. 3. Stir in lime juice and oil. Season to taste with salt and pepper, and add more lime juice, if desired. This recipe was SO simple but tasted SO good. I got so many compliments on this dish and my non-bean eating boyfriend even liked it. The most difficult parts for me were 1. going to the grocery store 2. chopping the onions and jalapeno and 3. draining the black beans. So this wasn't actually difficult at all. I did have to add more lime juice at the end and a little more salt. As the recipe's written, it seemed a little bland to me. But maybe that's because I'm used to Chipotle's uber salty rice. Next time I might use some spicy black beans to see if that adds a little more spice, too. The great thing about this is that the recipe makes a big batch that's great for taking to a party and it's so good that your friends won't even grumble about eating vegan food. It's tough being a veg or vegan at a big gathering that doesn't primarily involve vegs or vegans. Last Thanksgiving was my first as a veg and when I told my family that I didn't eat meat anymore my aunt repiled "But you can still have turkey. That's not meat" Some people only see meat as being red and coming from a cow or pig. Kudos to you for standing up for your beliefs and for making an awesome dish that would please omnivores and non-meat eaters alike!